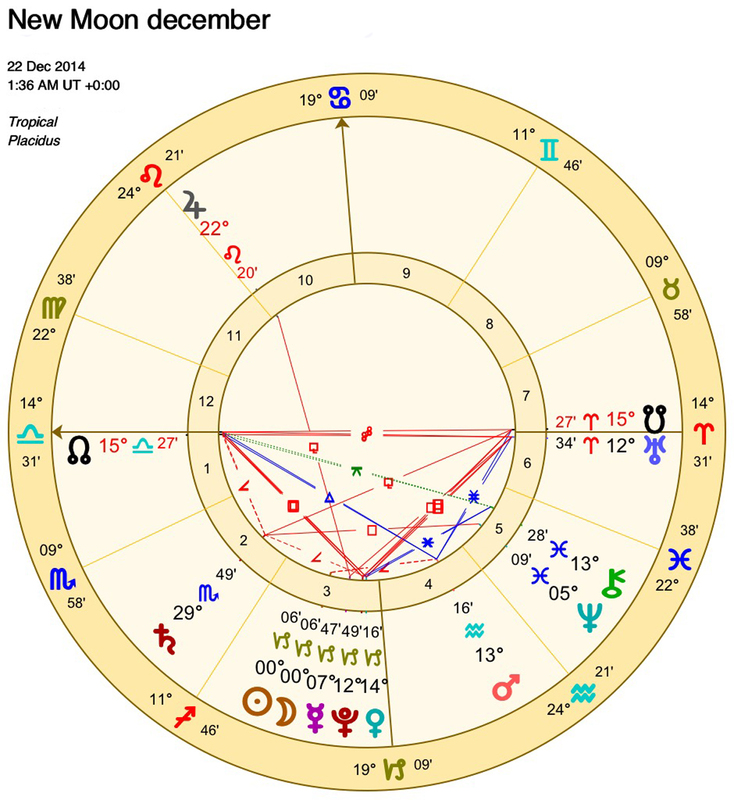 The solstice this December heralds the new moon at 0 degrees Capricorn on the 22nd at 0136 GMT/UT. Most planets in this chart are below the horizon confirming the ongoing, unseen shifts in the collective unconscious. Anchored by no less than five planets in Capricorn (Sun, Moon, Mercury, Pluto and Venus) maybe this marks the true beginning of people starting to speak out against institutions that seek to control and inhibit. There is still shyness and reticence there but Pluto continues to lurk near the Sun-placements of many countries (1st January constitutions at 11 degrees Capricorn) suggesting its work continues to up-end and transform those who refuse, deny or are slow to transform. Saturn at the anaretic degree(29) in Scorpio hints at continuing worry and dithering which new foundations should be put in place and which truths should be quashed or smothered from the view of the majority. Mars in Aquarius hold out for freedom and truth for all but also reflects the need to fight to get it. Neptune and Chiron in Pisces continue their dance of ‘smoke and mirrors’ and the need to see past what our attention is deliberately being drawn away from. Jupiter – the only planet above the horizon, is in Leo, so shows that leadership is there but it might show how things should not be done rather that give a blazingly good example for all to follow. Finally the Ascendant in Libra, Descendant in Aries conjunct Uranus, the esoteric ruler of Libra. Here comes the revolution! Libra cannot help but upset the status quo to help a new balance to emerge. Uranus in Aries will provide the energy and drive without the fear of what needs to be destroyed to protect the inner sense of cosmic order that Libra represents! You have been warned……….